Vaison la Romaine has a major Tuesday market and a Gallo-Roman history that has left behind many cultural and archeological artifacts. You can focus on one or both. I wanted on my first trip there in 2008 to climb up to the castle, but I was wearing a boot for a broken bone in my foot and walking over the crumbled rocks was out of the question. Sister and I visited there in 2011 and were headed up toward the castle when we were involved in a harrowing incident. We continued up to this same point, but both of us were too shaken to undertake the climb to the castle. Now I figure I'll not likely be in physical shape to get past that "Danger Cliff" sign, so we didn't even take a shot at it this year. But we did go to market. And I remembered to take pictures of the colorful sights there. Here Sister is looking at scarves. Two years ago, the combined group purchased (collectively) 70 something scarves. We were a little more restrained this year. I still haven't found enough occasions to wear all those I purchased. But I did buy this blouse, which is a little bluer than it appears here. It's very gauzy, but the French clothing manufacturers seem to include an under shirt for these frothy things. These ladies may wear plain, modest head scarves, but they like colorful clothing. Look at that lamb and the pork chops, not something we dared buy with an entire day out in the car planned. Sister and I recalled past difficulties in finding les toilettes on our previous visit here, so we and Linda decided to ensconce ourselves in a brasserie before the lunch hour for beverages, with the intent of staying for lunch and starting as early as they'd serve us so we wouldn't be delayed by those lengthy French lunches or scouting out toilettes from making our departure rendezvous on time. Our waiter took our lunch order before noon, often hard to find. Sister pours me some ice cold water from a violet bottle. Provision of cold tap water to a restaurant table seems to be becoming more common in France, rather than trying to slide in the expensive mineral water. I had a salad, and Linda had a mammoth lunch. Sister's was somewhere in-between, as I recall. After lunch, we had a reasonable amount of time to find our way back to the meeting place at the wine co-op. I, however, spotted a tote bag I had to have, and managed to catch the eye of the owner the stall, who was down the road a bit taking things down. Getting all the vendors out by their deadline is a process worthy of a military maneuver, and quite a jam up to press through. We were on time for our rendezvous. No one else was, having gotten trapped by the lengthy lunch service. The wine co-op was closed for lunch, so we perched at the edge of a flower box to wait for the rest. While we were waiting, a car stopped for a pedestrian. The car behind it stopped. The truck behind that one, didn't. All vehicles were damaged enough not to be able to drive away. The co-op parking lot became a detour for traffic. Despite the chaos, Beth, our driver, and Guille, her partner, managed to get us into her car and we headed off to salvage our afternoon appointment for a tour at the lavender distillery. Meanwhile, Lisa and her crew were waiting for their server to deliver the check. We were late for our appointment, and I was "forced" to sit on the terrasse at Distillerie Bleu-Provence, eating two scoops of luscious ice cream while Beth explored options for after Lisa's group arrived. Those would be waiting over an hour for another private tour in English, or joining the public tour, to be conducted in French and English, beginning at the next half hour. We chose the latter. The charming Giovanni, the tour guide whom we met on a visit a couple of years ago, started beside the big vats that the freshly cut lavender is piled into. You walk past these as you enter the distillery. Pressure is applied, liquid is introduced, and vaporized lavender goes through the condenser coils. We move upstairs (we three who had our walking sticks were offered rides on the elevator) to rooms set up with pictures and educational materials about the distilling process. There's this great view out of the upstairs window, which makes me want to come back and explore the town some time. It seems that not all that we call "lavender" is true lavender. There is also "spike" lavender, and then there is lavandin, a hybrid. True lavender is used in perfumes and lavandin is used to provide the lavender scent in other products. We started with a chart on how to distinguish one from the other by the structure of the flower stalk, just in case we want to figure out what's growing in that field, or even our garden. Giovanni segues so seamlessly between French and English that we're in awe. He takes us outside again. 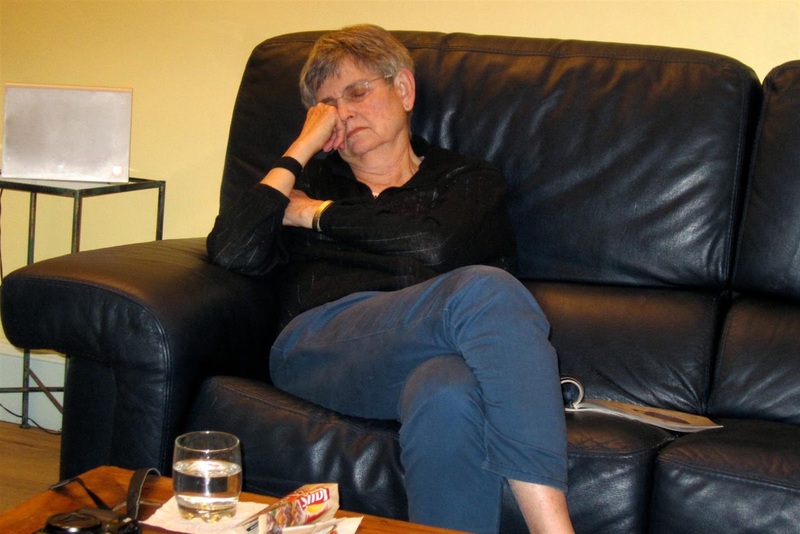 (Someone speculates that we tourists tend to nod off if we sit too long in the classroom. Yup.) I'm mesmerized comparing the French to the English narrative, so much so that I totally forget what he was talking about. Something about oil floating on another liquid. This doesn't show the milky liquid as well as another photo I took, but I'm enamored of this profile picture. Back into another classroom, where there is a schematic of the process downstairs where we first came in. These boots are available in the gift shop. I love them! I could not figure out how I could fit them into my carry on bag. Loved these lavender diffusers, too, but I'm not sure they're electrically compatible with U.S. systems. And so it was, back to the villa at the end of the day. I remember little else of the day. Sister has given me this picture of me that evening. Sounds like a wonderfully full day out! I'm very glad you didn't take the cliff road, love your tote bag, and the whole lavender distillation process is fascinating! I'm very much afraid those boots would have come home with me--not in my carryon, not in my checked bag, but on my feet! I don't mind being la vieille americaine eccentrique! Cliff accident? Yikes. You're probably wise to stay of solid ground. And with all that lovely lavender hanging around, why on earth would you want to be any place else? I think I'm addicted to lavender. Have you seen any unusual foods with lavender - i.e. ice cream, tea, scones, etc? Just wondering. on solid ground - not of. Shucks!